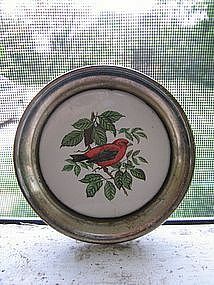 Vintage silverplate coaster with porcelain tile of what looks like a Scarlet Tanager. It is 4 1/2 inches in width. The silver portion has wear to the finish and the porcelain tile has a couple of tiny fired-in dark dots. I have other coasters with different birds. Additional photos by email. I need your zip code to calculate the postage.